GZT Series Vibrating Feeder adopts the vibrating motor to produce vibration force. It is used to feed material into primary crusher homogeneously. Meanwhile because of the bar-shaped screen, it can screen away soil contained in the raw material, increase the capacity of primary crushing. It is suitable for feeding material into the first crusher in hydroelectric field, building material and mining. GZT-0932 vibrating feeder mainly adopts a pair of motors as the vibration source, which has the completely same performance and parameters. When these two vibration motors rotate reversely at the same angular speed, the inertia forces produced by their eccentric blocks will overlap or counteract each other at a special phase. Thus, a huge resultant vibration exciting force will be generated so that the machine body will be forced to vibrate on the bearing spring. This vibration is used as the power to make the material slide on the material chute and drop so that the material moves forward continuously. As a result, material feeding purpose is realized. When the material passes the screen bars of the chute body, smaller pieces of material will drop from the gaps between the screen bars and not enter the next breaking procedure. In this way, material screening result is achieved. 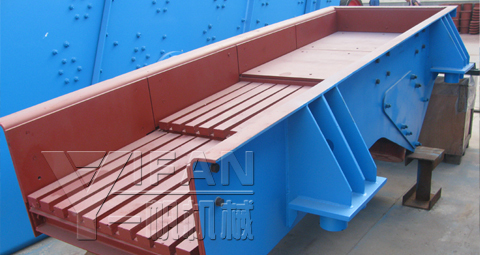 Vibrating feeder can feed the block and grain materials into the crusher evenly, timely and continuously. 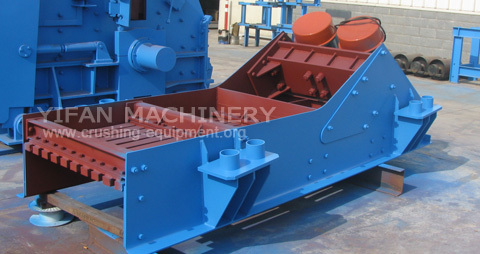 During the sand or aggregate production, vibrating feeder can feed the materials into crusher and prescreen them. It is widely used in metallurgy, coal industry, mineral selection, building material, chemical industry and grinding field. 1. This series feeder has different types. It can be designed and manufactured according to the customer’s requirements. 2. All feeders can feed the materials manually or automatically. 3. Smooth vibration, reliable operation, and long service life. 4. The vibration force can be adjusted, and the material can be changed and controlled whenever necessary. 5. Vibration motor acts as the vibration source, which ensures low noise, low power consumption, and good adjustability. 6. Simple structure, reliable operation, easy maintenance.